The latest release of newly declassified materials with respect to the U-2 by the CIA should prompt Indian policymakers to rethink the parameters of the foreign and security policy debates in the country. The loss of Francis Gary Powers’ U-2 spy plane over the former Soviet Union, when it was shot down on May Day in 1960, was a truly defining moment in the Cold War, as it prompted a binding pledge by President Dwight Eisenhower to end all over-flights over the Soviet bloc. Similarly, the latest release of newly declassified materials with respect to the U-2 by the CIA should prompt Indian policymakers to rethink the parameters of the foreign and security policy debates in the country. The declassified CIA materials disclose that India was not far behind America’s Cold War allies such as Pakistan or Thailand for providing base for the US’ spying assets geared for keeping a close eye on the Chinese. The disclosures come at a poignant moment when rightwing nationalists in India are screaming from the rooftop that the “soft” Indian state is failing to stop predatorial powers – China and Pakistan – that are on the prowl to taunt and bleed the country by inflicting a thousand cuts on it. The CIA disclosures expose that India has never really been a “soft” state under Congress Party’s stewardship. On the contrary, it has been one of the most diabolical countries in the modern world when it comes to foreign and security policies. The Indian state is as hard as nail. Post-independent India under the leadership of Jawaharlal Nehru espoused non-alignment as a fig leaf while pursuing wanton policies in its perceived national interests. Indeed, at different points in its chequered history, Congress-led governments in India have unilaterally drawn the country’s border in the Himalayas, used military force without hesitation to annex territory, split one neighbouring country into two nice little halves, bled the protagonists in at least two neighbouring countries’ fratricidal strife and collaborated with the CIA in fomenting trouble in yet another neighbouring country. (Ironically, all such diabolical acts have taken place during Congress governments.) The nadir is now reached when it transpires that Nehru was himself was a collaborator of the CIA. Such stunning disclosures do a world of good for the foreign and security policy discourses in our country that are otherwise heavily laden with hypocrisy and hubris and a morally decrepit attitude of self-righteousness. The latest US disclosures come at a time when Indian pundits are again riding the high horse alleging that Pakistan is provoking a war against India. The country has shown a mental block in even entertaining a lurking possibility that the recent incident in Poonch sector on the Line of Control in which five Indian soldiers were killed by intruders from Pakistan was probability an act of retaliation in a by-now familiar enough chain of events where one side acts belligerently and the other side reacts and the action-reaction syndrome eventually builds up to a crescendo and something barbaric ensues. Question: I feel that in UPA 2, diplomacy ruled over security policy. Khurshid: You asked a very tough question. I am saying ‘tough’ because I want to speak at length on it. I will have to tell things related to security policy, which are not normally spoken about. Even the defence minister does not speak those things. Why such coyness? Why not instead openly “tell things related to security policy?” On the contrary, the jaundiced discourses on foreign and security policies that take place in India today are going to cause enormous damage to India’s democratic system. The discourses are increasingly putting the elected government at a disadvantage and are steadily eroding the principle of civilian supremacy that is cardinal to democratic functioning. Plainly put, the government is not taking the country into confidence regarding what exactly is going on in the disputed border regions with China and Pakistan and is instead ceding ground in decision-making more and more to local military commanders. What is taking place is that each and every reported incident on the border with China or Pakistan is causing embarrassment to the government and eroding its credibility for being decisive and capable. The right wing lobby is spreading the canard that the military’s hands are tied from retaliating with maximum force against China and Pakistan by a timid government in Delhi. Whereas, the fact of the matter is that the Indian military cannot hope to acquit itself any different, substantially speaking, from its past confrontations with China (or Pakistan). There is a veritable military stalemate both on the Line of Control with Pakistan and on the Line of Actual Control with China, which India is not going to be able to change to its advantage on the ground. China is poised to by far outstrip India as a military power while Pakistan remains determined, no matter what it takes, to preserve its deterrent power vis-à-vis India. Therefore, one could call it “frozen peace,” because in a foreseeable future, India is also unlikely to have a strong enough coalition government at the centre, which could take the tough decisions needed to compromise, in a spirit of give and take, either on the Kashmir dispute or the border dispute with China. Second, who stands to gain? Of course, the ultra-nationalist forces of Hindu nationalism are making a big ruckus about national security in the hope of exploiting it as an emotive issue in the forthcoming 2014 parliamentary poll. Then, there is the ubiquitous fatcat – the retired general (or brigadier) who presents himself as a think tanker and profound strategic thinker, whose real agenda is to work for big western arms manufacturers make a fabulous living out of arms dealerships and contracts. Finally, there is the military itself, which is incrementally shirking off the civilian supremacy over its functioning and arrogating to itself a high degree of autonomy that is contrary to the spirit of democratic rule. At least a couple of influential anchormen in India’s prominent television channels with links to the military can be easily identified as playing this invidious game of feeding off national security issues, creating discord between the civilian authorities and the military leadership (where none exists) and, generally speaking, endearing themselves to the “Hindutva” lobby. In sum, an incestuous club of self-seeking opportunists and time-servers and fatcats has come to dominate the foreign and security policy debate in the country. The scenario is a disquieting one. Where could all this lead to? There could only be two possibilities – one, the country lurches toward a war with China or Pakistan at some point and suffers yet another humiliating defeat, or, worse still, a futile stalemate; or, secondly, at the end of it all, under the sheer weight of the massive military expenditure it cannot afford (with around 700 million Indians living in abject poverty), the country collapses in sheer exhaustion – there have been instances of such things happening in modern history. 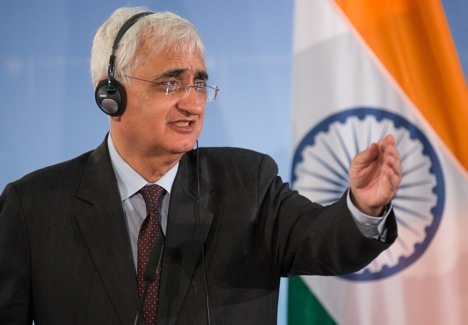 Khurshid’s remarks suggest that the national leadership senses the need to do to bring some degree of rationality and balance into what passes in today’s India for national debate on foreign and security policy. But then, he is still reluctant to speak up, presumably because of fear of a fierce political onslaught from Hindu nationalists that could have serious repercussions for the ruling Congress Party’s electoral fortunes in the crucial 2014 poll. This is where the U-2 disclosures could be a helpful signpost. Perhaps, the political class is underestimating the average Indian’s intellectual capacity (or native genius) to make out the grain from the chaff. The ease with which he took in his stride the startling disclosure that Nehru was a past master in doublespeak – berating imperialism constantly while hobnobbing secretly with the CIA – underscores that the average Indian probably understands perfectly well what Khurshid refuses to disclose as things that are “not normally spoken about”.